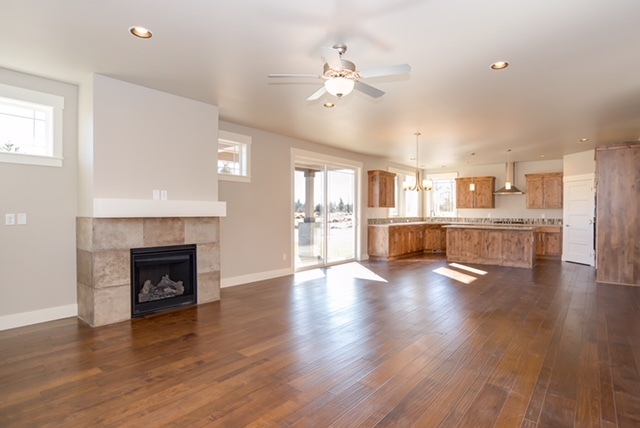 This beautiful single level open concept home is located in Redmond's brand-new Canyon Rim Village neighborhood. 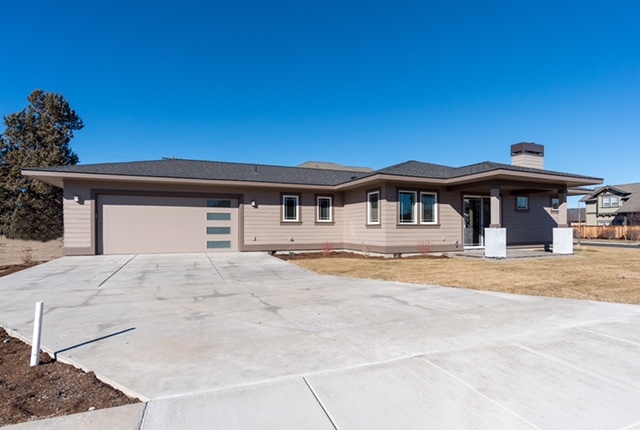 We blended a modern design with Central Oregon's beautiful neutral color palette for a home that stands out in the neighborhood, but blends in with the scenery. The first thing one notices about this home is its covered front porch area, numerous windows, and long driveway. We built an area at the main entrance to the home that's dedicated to lacing up boots on snowy days, and storing hiking/running shoes. This opens up into a spacious open-concept living room and kitchen space with tons of natural lighting. The home's laminate wood flooring is more durable and long-lasting than real hardwood. The natural stone fireplace is a wonderful area for gathering, with pendant lighting marking the perfect spot for a dining area. The kitchen/living/dining area opens up to a covered porch to enjoy the gorgeous Central Oregon weather. The kitchen is a chef's dream! With counter tops that seemingly go on forever, a gas stove, spacious pantry, a huge island, and plenty of cabinet space, it's designed for cooking delicious meals and entertaining . The custom tile back splash and recessed canned lighting are a couple of extra details to finish this custom kitchen. We dedicated plenty of space to a luxurious master suite in this custom Redmond home. We added plush neutral-colored carpet to this room for a cozy feel, and a recessed ceiling. Plenty of windows add natural light and let in Central Oregon's beautiful blue skies. 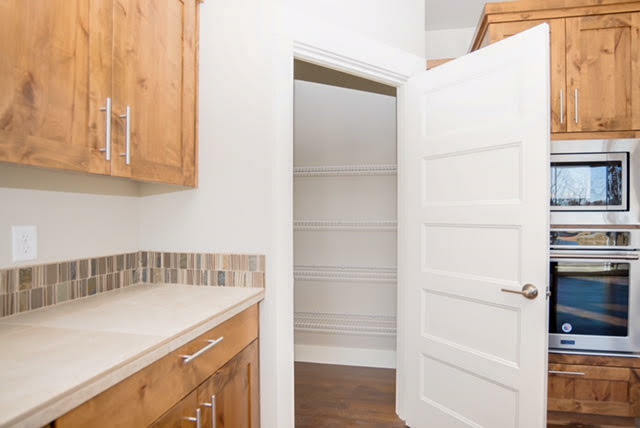 We also added a walk-in closet to the master suite because there's never enough space for your clothes! Dual sinks and a luxurious spa-like shower set this custom bathroom apart! We added a space between the sinks for extra storage underneath and a few more feet of counter space. We made sure to add a laundry/mud room between the garage and the rest of this home so future owners can get rid of any unwanted dirt/snow. 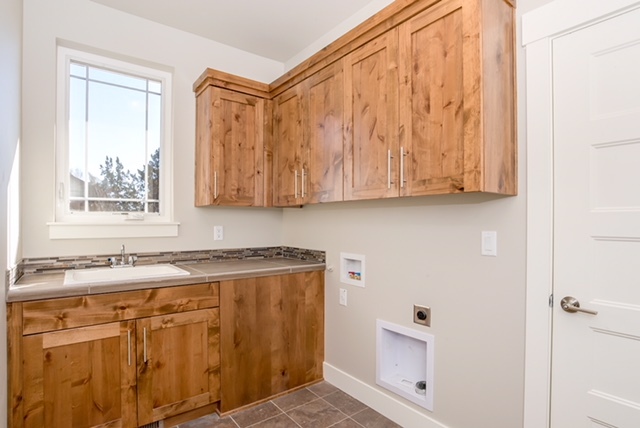 Complete with a counter, a sink, and plenty of cabinet space, this room is a wonderful addition. Having a designated area for laundry can really make a huge difference!